1. Put the fruit in a bowl and sprinkle over the cinnamon. Roughly crush with the back of a fork and drizzle over 1 tablespoon of the maple syrup. Set aside for 10 minutes to let the juice run from the fruit. 2. Toast the brioche slices on both sides until golden. 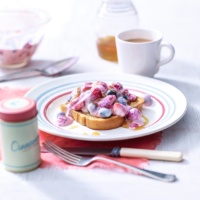 Fold the fruit through the Alpro Simply Plain and spoon on top of the toasted brioche slices. Drizzle over the remaining maple syrup to serve. Turn your brioche into crisp cinnamon toast by mixing ¼ teaspoon of cinnamon with 2 teaspoons of granulated sugar and scatter over the brioche. Toast for 2–3 minutes until crisp.